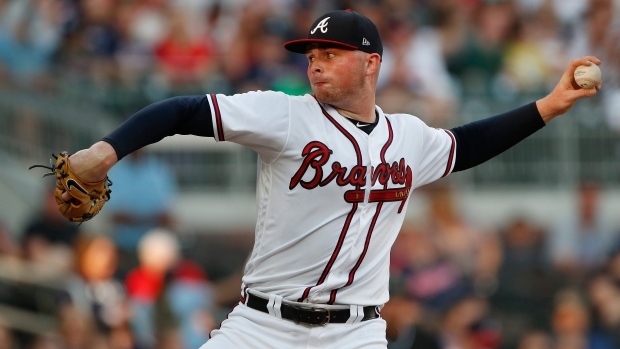 ATLANTA — Sean Newcomb couldn't summon the usual bite on his fastball, so he decided to just settle in and pitch. "I didn't have my best stuff all around, I'd say, but I was able to get some fastballs in the zone, make other things work a little bit, get some weak contact," he said. "That's all I was trying to do." Newcomb pitched six strong innings to win his fourth straight start, Johan Camargo and Ozzie Albies each drove in two runs, and the Atlanta Braves beat the Miami Marlins 8-1 on Saturday night. Ender Inciarte went 3 for 4 and Freddie Freeman added a two-run homer in the eighth to help Atlanta win for the eighth time in 11 games and hold onto the NL's best record at 27-17. Newcomb (5-1) had thrown 21 consecutive scoreless innings, the longest active streak in the majors, before the Marlins took a 1-0 lead in the second when Justin Bour singled, advanced to third on Cameron Maybin's double and scored on a groundout. Newcomb allowed four hits and two walks with four strikeouts. He is 4-0 with a 0.36 ERA in four starts this month. Braves manager Brian Snitker thought the left-hander showed maturity when he wasn't feeling as strong as usual. "It seemed like he had to really grind through this one," Snitker said, "but he stayed current with pitch to pitch again and made some good pitches when he had to." Jose Urena (0-7) lost his eighth straight decision, with his last victory coming Sept. 20 against the New York Mets. The Marlins have lost each of his 10 starts this year and 12 straight overall to match the longest streak in club history, set by Brian Moehler from 2006-07. The Braves scored four runs in the fifth to take a 4-1 lead. Inciarte reached on an infield single as the ball deflected off first baseman Bour's glove. Second baseman Starlin Castro fielded the ball and lifted it toward first with his glove to retire Inciarte, but Bour and Urena collided at the bag and the ball bounced away, allowing Inciarte to advance to second and Kurt Suzuki to third. Suzuki scored on Camargo's RBI single, and Inciarte scored on a sacrifice squeeze bunt by Dansby Swanson. Albies' single cleared the bases. Suzuki's sixth homer and Camargo's RBI double made it 6-1 off Jarlin Garcia in the seventh. Freeman has nine homers, including four in six games against the Marlins this season. Urena gave up five hits and four runs in six innings. "Jose was good — really can't ask for much more from him," Marlins manager Don Mattingly said. "His pitch count was down and he got ground balls. We just didn't make any plays for him that inning, I thought." Marlins: C J.T. Realmuto got the day off with the Braves starting a left-hander. Though his .332 road average since the start of 2016 ranks third in the majors, Realmuto is hitting .211 in 21 plate appearances overall against lefties this season. Braves: Swanson, reinstated from the disabled list after missing 13 games with left wrist inflammation, went 0 for 2 with one run scored and one RBI. Snitker said LHP Luiz Gohara will make his starting debut Wednesday at Philadelphia unless he's needed for extended bullpen work over the next four days. The Braves have an open spot after RHP Mike Soroka went to the DL with shoulder tightness. Gohara was projected to be a regular in the rotation before ankle and groin injuries sidelined him throughout spring training. Since getting recalled from Gwinnett on May 8 to pitch in relief, he has no record with a 1.29 ERA in seven innings. Marlins: LHP Wei-Yin Chen (1-2, 7.56) will make his first start against Atlanta since 2016. He pitched 4 1/3 scoreless innings in his last outing against the Los Angeles Dodgers earlier this week. Braves: RHP Julio Teheran (4-1, 3.49 ERA) will make his 18th career start against the Marlins and is 6-5 with a 3.49 ERA in the series. Teheran has won three straight starts overall.